Today we will be exploring with our featured guest Chris White, The three places God and we observer where Science has come a point beyond physical prayer, meditation, voice: speaking also how Water and Food carry Knowledge … Where does this knowledge come from & how can the knowledge from food and water make a difference? Between 2008-2009 Chris received a prophetic dream of one tribe of people coming together that pleased Great Spirit and reached backward and forward in generations. The first of these people would be Native Americans in spirit, but include people from every race, religion and background. “Father,” “Creator God;” and Love “Human-hood,” i.e. love your neighbor as if it were yourself. Chris’s dream told him to tell three native spiritual elders about this short story that he was given. Then Chris learned of Quanah Parker Comanche Chief, who, when was seriously wounded, had a vision of Jesus Christ who instructed him to make peace. After making peace, Quanah Parker later founded the Native American Church, which the foundation is Native American spirituality and Christianity. 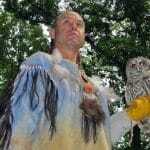 What is Native American spirituality: creation, nature, the Great Spirit in all things. What is Christianity: belief that Jesus Christ the Son of God, thorough which all things created were created. This led Chris to James Warren (Flaming Eagle) Mooney Seminole Elder, Medicine Man and co-founder of Oklevueha Native American Church who is the Priory of the Indigenous People Under the Grand Priory of the United States of America for the Hospitaller Order of Saint Lazarus of Jerusalem.